Last Wednesday, Donald Trump exposed his position regarding the US’ external policies. A presentation took place in the walls of the Center for National Interest (formerly known as the Nixon Center), which made a serious impression on the American public. Neoconservatives and hawks saw the danger of the revival of isolationist speeches. Liberals who criticize Trump decided to target certain contradictory statements. What was Trump going to say and why do many not want to understand it in American society? First and foremost, it is worth paying attention to the fact that Trump delivered the speech after the stunning victory in five northeastern states in the primaries on Tuesday. Now, even his enemies are forced to recognize that Trump’s nomination as the Republican candidate in the presidential election seems imminent. Trump is not a professional politician; previously, he could afford to say anything, but he must now get used to speaking as a politician and as a diplomat. Hence it is the first source of contradiction and oddity in Trump’s speech. He is trying to use diplomatic language, but he is not very good at this. Diplomatic language itself is full of euphemism: a phrase, depending on the context, can invert its meaning. For example, a country should support in words the ideology of human rights, although it does not necessarily comply with this in practice. All of the modern politicians swear allegiance to democracy, although everyone understands this concept in their own way, etc. There is a set of concepts that are maybe not followed in real politics, but politicians give them their rhetorical support. In Trump’s speech, all the words of peace, democracy - that the US will be a reliable partner for its allies - is the usual diplomatic euphemism that can mean anything, and usually means nothing. President Obama has not been a friend to Israel. He has treated Iran with tender love and care and made it a great power. Iran has, indeed, become a great, great power in just a very short period of time, because of what we've done. All of the expense and all at the expense of Israel, our allies in the region and very importantly, the United States itself. We will spend what we need to rebuild our military - it is the cheapest, single investment we can make. We will develop, build and purchase the best equipment known to mankind. Our military dominance must be unquestioned, and I mean unquestioned, by anybody and everybody. We left Christians subject to intense persecution and even genocide. We have done nothing to help the Christians, nothing, and we should always be ashamed for that, for that lack of action. Equating US working with allies who aspire to acquire NATO membership and Putin invading and annexing European territory is grotesque. "It's isolationism surrounded by disconnected thought, demonstrates the lack of understanding the threats we face,"
Washington Post columnist Jenifer Rubin called the speech “Trump's toxic brew of protectionism and isolationism”. Trump’s speech, in particular, contains provisions that indicate a radical revision of the approach to foreign policy. 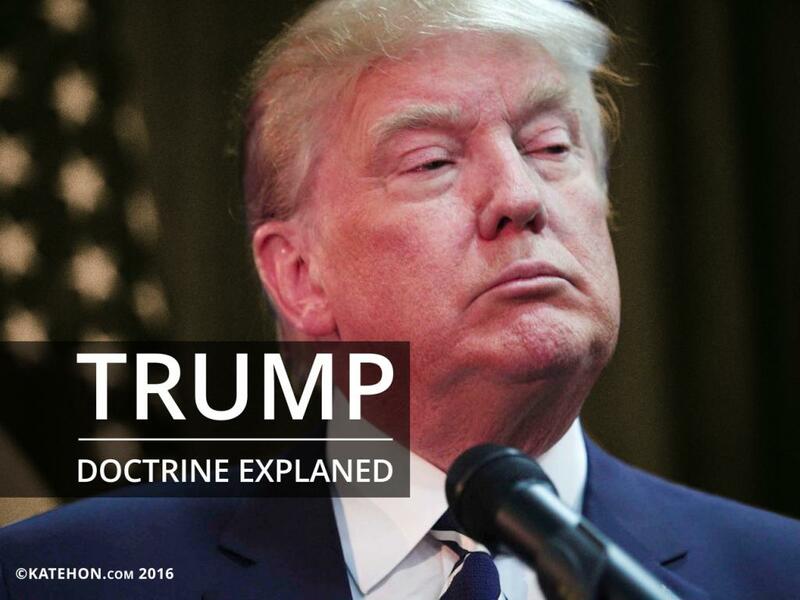 "Trump Doctrine" can be briefly described as a return to good old realism. 1. Trump began his speech with an important thesis, promising a new foreign policy “direction for our country, one that replaces randomness with purpose, ideology with strategy, and chaos with peace”. Thus, he is already showing loyalty to the realistic approach, which contrasts with the strategic thinking foreign policy ideology of the Liberals. In addition, Trump stressed that the result of Obama's foreign policy has been the proliferation of chaos. Like a typical realist, Trump wants to replace the chaos with order. An adoption of the strategy of "controlled chaos" by Steven Mann has become a feature of Obama's foreign policy. What Trump sees as a mistake, Obama's strategists see it as a deliberate policy. Against the backdrop of the global sprawl of chaos, the US, with all their problems, become an island of relative stability, which boosts the dollar, confidence in the US, and the loyalty of its allies, i.e. strengthens the unipolar world. Trump does not accept this strategy, and considers it to be disastrous for America, because chaos can ultimately overwhelm the US too. We're going to finally have a coherent foreign policy based upon American interests and the shared interests of our allies”. We will no longer surrender this country or its people to the false song of globalism. The nation-state remains the true foundation for happiness and harmony. 3. A State exercising its foreign policy is guided by national interests that rely on power. This realist maxim is fully consistent with the basic content of Donald Trump’s speech. That is why he called for dialogue with Russia and China from a position of strength, and puts as its main objective the strengthening of the state’s military and economic power. Realists believe war and aggression to be the natural condition of international relations. However, this does not prevent states from negotiating with each other. Therefore, there is nothing contradictory in the fact that Trump on the one hand encourages an agreement with Russia and China, and on the other offers to put strong pressure on China and perceives the growing military potential of both countries as a threat. It is significant that, like classical realism, Trump pays more attention to economic and military potential, rather than to the popular-among-liberals "soft power". The world must know that we do not go abroad in search of enemies, that we are always happy when old enemies become friends and when old friends become allies." He added, "that's what we want: we want to bring peace to the world. From Trump’s point of view, the US cannot have eternal enemies and friends - only interests. 5. The balance of power and the balance of interests. From the perspective of realists, state interests can be calculated mathematically. Trump shows a similar trend with his main idea: the action must be justified, should not cost a lot, and has to be rational. Therefore, Trump asked a reasonable question: why does the US intervene in a conflict where the interests of the US as a nation-state are not obvious? What does NATO do for ordinary Americans? Why isn’t NATO fighting terrorism and migration, which is a real threat, unlike the mythical Russian aggression? Why does the US still need this structure today? If Europe also need sit - the Europeans should pay for it, and if they do not pay, why does the United States maintain its existence? The United States, as the center of a global empire, needs NATO, but for the United States as a nation state, this structure seems excessive. In response, Trump’s critics talk about the threat of Russia, not noticing that it was NATO that came close to Russia's borders, rather than Russia to the US. 6. Refusing to spread Western institutions and values around the world, and the idea of spreading Western-style democracy, including the establishment of the neoconservative "Bush Doctrine" and the liberal "Obama doctrine" by force. Trump believes that this policy is an irresponsible and dangerous one. It is based on a liberal "democratic peace theory": it is necessary to overthrow dictators and establish Western democracies, as it promotes the pacification of the planet, because liberals believe democracies do not fight each other. Realists have always opposed this idea, believing that all political regimes behave, in their foreign policy, in more or less the same way, and therefore it makes no sense to seek to spread democracy to realize a state’s national interests. It all began with the dangerous idea that we could make western democracies out of countries that had no experience or interest in becoming a western democracy”. 7. The last paragraph of the Trump doctrine is directly linked to the previous one, but in fact is revolutionary even for realists. Trump refuses to recognize the existence of universal values that should be shared by all the inhabitants of the planet. Instead of trying to spread universal values that not everybody shares or wants, we should understand that strengthening and promoting Western civilization and its accomplishments will do more to inspire positive reforms around the world than military interventions. By separating the West as a distinct civilization and referring to "Western values", Trump does not deny other civilizations the right to exist. The west has yet to prove its value; in fact, it is a call for dialogue among civilizations, which lays the foundations for the concept of a multipolar world. Donald Trump made a revolutionary speech, and because the US almost forgot about classic realism, for many the speech seemed strange. American politicians and journalists are accustomed to thinking in terms of the liberal paradigm, so the politician who dares to make a realist foreign policy program looks comical to them. The idea of giving up universal values seems also inconceivable. That would be a spectacular repudiation of the whole concept of Western civilization and the Enlightenment - and also a stark reversal of more than a half-century of American engagement with the world. Yes, John. You understood everything correctly.